Robert Englund (Freddy Krueger!) Talks About Freddy vs. Jason vs. Ash, and More! 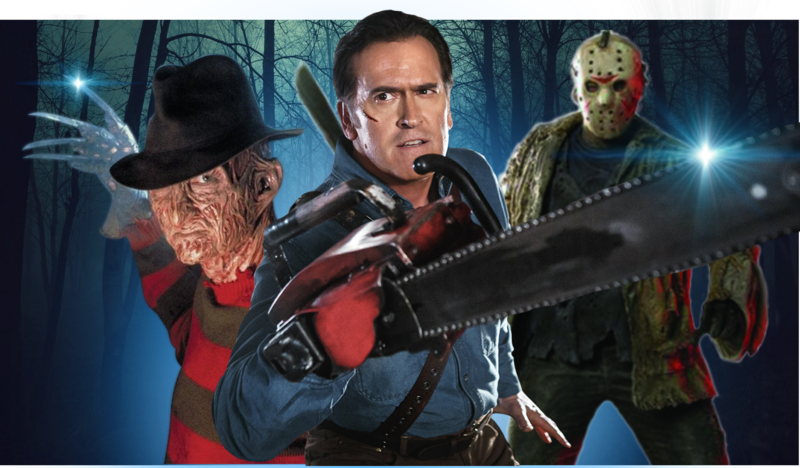 Robert England appeared out in Palm Springs at the Comic Con Palm Springs May-Hem, and he had plenty to say, including something about Freddy vs. Jason vs. Ash, the best idea for a horror icon matchup that we’ve ever heard! Why do horror films have to be so serious and so devoid of fun? Remember the 80s, when horror films made us laugh and squirm and scream in the same moment. Here, one of the decade’s biggest and best-loved icons of the horror genre doesn’t hold back. Check it out! Here, he tells us what happened to the Freddy vs. Jason vs. Ash film. In this video clip, Robert Englund describes how A Nightmare On Elm Street made him an internationally recognized star — including with the grandmothers in Europe! In this next video, Robert Englund describes how he would make a Freddy movie if he had $50 million. I’d pay to see this version! Maybe England should switch over to directing instead of being Freddy. PLUS, he describes the true nature of Freddy Krueger. This week on our podcast, we discussed Comic Con Palm Springs, and our panel with Robert England, among others. Check us out right here! PLUS, if you haven’t already, check out our video recap of Comic Con Palm Springs May-Hem.